The human body has several organs such as the hands, feet, heart, etc. If atoms that are not aware of themselves construct organs, then how can they produce immensely enormous organs such as the hands, feet, and heart? 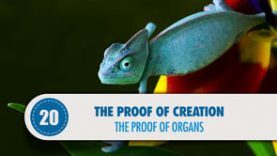 How is it that atoms that have no knowledge regarding the conditions of life are able to design the organs in a way that is compatible with these conditions? How is it that the eye’s atoms that have never seen the sun before are able to construct eyes that see the sun? How is it that the ear’s atoms that have never heard sounds before are able to construct ears that can hear? How is it that the tongue’s atoms that have never tasted anything before are able to produce a tongue that can taste? How is it that the nose’s atoms that have never smelled a scent before are able to produce a nose that distinguishes all sorts of scents? This question is also pertinent to the other organs of the body. Molecules do not have molds. Despite this, the organs they assemble look like as if they have come straight out of a mold. How can this be achieved? How do they determine the most befitting spots for these organs and how do they place these organs into these most suitable spots? How do they determine the number of organs? It seems as if these atoms are as intelligent as Avicenna! Even if there were a thousand Avicennas, they probably would not be able to fulfill any of them. Then, how is it that these atoms are able to accomplish these tasks? In addition, let us not overlook this: When a child is five years old, he can no longer wear the shirt he was wearing when he was a year old. Likewise, when the child becomes ten years old, he can no longer wear the shirt he was wearing when he was five years old. And when he is 20 years old, he cannot wear the shirt he was wearing when he was 10 years old. That is, as man grows up, the garments get smaller. However, a person does have a garment that never gets small as he/she grows up, and it is the garment of the body skin. Who is the tailor who expands the garment as the body expands, who widens it when the body fattens, makes it smaller when the body loses weight, and who alters the garment perfectly by not making it too tight or too loose? This is also applicable to animals and trees. Who is the Entity that sews garments for so many trees and animals and that alters them as the trees and animals grow? While we have not been able to explain the formation of organs, we now have to deal with the appearance of these garments. Who else other than God could grant every creature perfect organs and sew them the most practical garments? Put the universe aside and think of only one fly: if all people were to gather, could they attach a wing onto a fly and sew the most suitable garment for it?